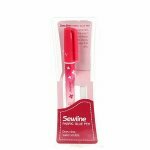 2 pack of refills for Sewline glue pen (or similar design). Also available in pink. 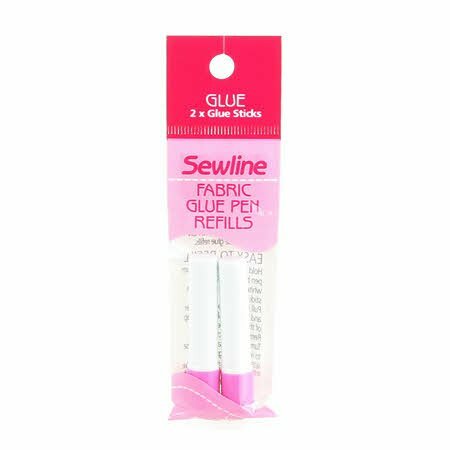 Sewline glue pens are a fast, easy way to baste your English paper piecing units. A convenient, pen like dispenser with archival quality. Solid glue stick. A small amount holds fabrics in place for sewing. No need for pins. The colored glue dries clear, no thick residue, water soluble and safe for most fabrics. Cut preparation time in half by glue basting instead of thread basting. Poole's Preference: A huge "must have" for my arsenal of tools. I have tried normal school glue sticks, and honestly yes - you save money. However, I went back to the glue pen because it was thinner which gave me more control for smaller EPP pieces (like on Dear Jane), and the glue is designed to release better than the school glue sticks. I had a lot of issues removing my papers because of the difference in the adhesive. For me, the added time and aggravation removing papers was not worth the savings. Sticky hands with the wider glue sticks were also an annoyance. It just made more sense for me to use the fabric glue pens. You don't need much glue at all on each seam, and it doesn't leave gloopiness behind.